Vertical Merger (Definition, Example) | Why Vertical Merger Happen? A vertical merger is a combination of two or more companies that are into the same industry but produce different products or services along the value chain. It provides a strategic tool for companies to grow their businesses and acquire more control over the steps supporting the supply chain. There are many players involved in a supply chain mainly including suppliers who provide the raw materials, manufacturers produce the product, distributors then provide it to the retailers who finally sell the product and services to the end customers. So why do companies get into vertical mergers? 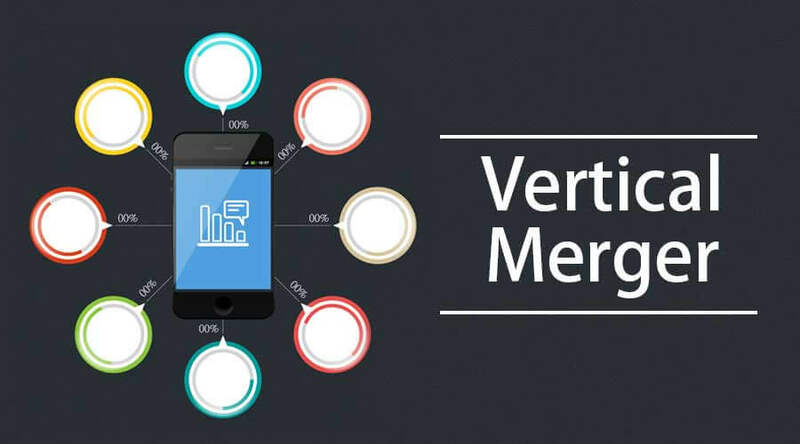 Vertical mergers allow companies to use the synergies that ultimately helps in operating efficiently, costs getting reduced and business expansion. It also allows companies to grow their operations into different phases of the supply chain. The opposite of a vertical merger would be a horizontal merger which involves a merger between two or more companies creating competing products or providing competing services and operate in the same stage of the supply chain. A very good example of a vertical merger would be a car manufacturing company merging with a tire company. It would not only benefit in reducing the cost for the automaker but also help in expanding the business by supplying the tires to other car manufacturers. So this type of merger not only will make the profit margins better by reducing the costs but also boost the top line i.e. the revenue through business expansion. A classic example of a vertical merger would be between eBay and PayPal in 2002. eBay is an online shopping and auction website and PayPal provides services to transfer money and allow users to make online payments. Though both eBay and PayPal were operating in dissimilar businesses the merger helped eBay to increase the number of transactions and proved a strategic decision overall. It can be classified into backward integration and forward integration. Backward integration refers to merging with suppliers and producers whereas Forward integration refers to merging with distributors and retailers. Many times vertical merger and vertical integration are used interchangeably. Though both require growing operations into other levels of the supply chain in vertical integration the business expansion can happen without merging two companies. For example, an aluminum can manufacturer company may decide to make its own aluminum instead of sourcing it from external suppliers would be an example of vertical integration though if the manufacturing company merges with the supplier company then it would qualify as the vertical merger. This type of merger creates value for the merged business that is worth more than the separate businesses under individual ownership. The rationale behind a vertical merger is to increase the synergy and operating efficiency as a single business entity. Vertical mergers, like other business transactions, comes with the controversial aspect as well. To start with, Anti-trust violation laws often come into play when such a merger is more likely to reduce the competition in the market. It can also be used by companies to block access to raw materials for other players in the supply chain and hence destroying the fair competition through unfair business practices. It also could be used by companies to collude to gain economic advantage in the supply chain. Competition is healthy for consumers as it allows the companies to brainstorm and provide innovative high-quality products and services to the end user. Though using vertical integration to gain the edge over the competitors is not illegal but using it to control the market by shady business practices like controlling the flow of raw material etc. may come under the purview of law and is subjected to scrutiny in many countries. After looking at a variety of benefits the vertical merger has to offer and weighing it against the challenges or consequences it may pose, it still looks a pretty strategic way to expand and operate efficiently. It uses purely depends on the intention of the merging companies as it could be used to kill the competition and control the players at different stages of the supply chain. Though Anti-trust laws are there in place to put a check to collusion and unfair trade practices like reducing the competition to a bare minimum in order to control the market still companies do it using vertical merger.